This cloth is a natural, reusable cleansing cloth to remove oils, impurities, and makeup - only apply warm water to the cloth and wash! This cloth is 80% polyester and 20% polymide. This secret of the FaceOff cloth is the weave of the ultra thin fibres that gently clean and exfoliate the skin. The cloth is fairly straightforward to use - wet the cloth with warm water and then gently wipe the cloth over the eyelids and face to clean to the skin. Overall, I thought the product worked really well - especially for just using warm water on this! I'm not sure if personally I would use this cloth every night to remove my makeup - I like my double cleansing routine I have gotten in to. But, what I will do with the cloth is it is going right in to my gym/yoga bag! 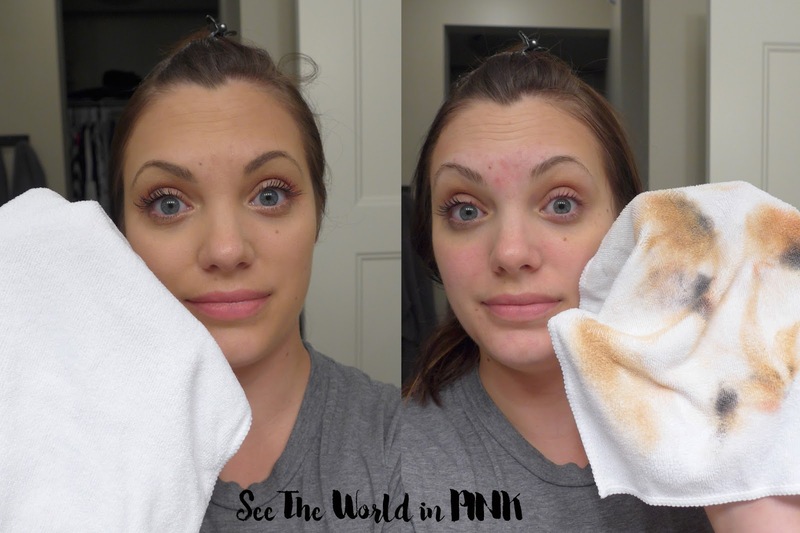 If I go to yoga, it is usually right after work and I hate dragging around a bunch of products - this is so handy to wash off the day off makeup on the go! Also, after each use, you need to wash this cloth with soap and water (I used baby shampoo and it was pretty quick and just needs to be hung up to dry). Would you guys us a product like this? Yes, these cloths are amazing! Yes - I was really surprised! I am just about to try out this. Sounds pretty amazing.